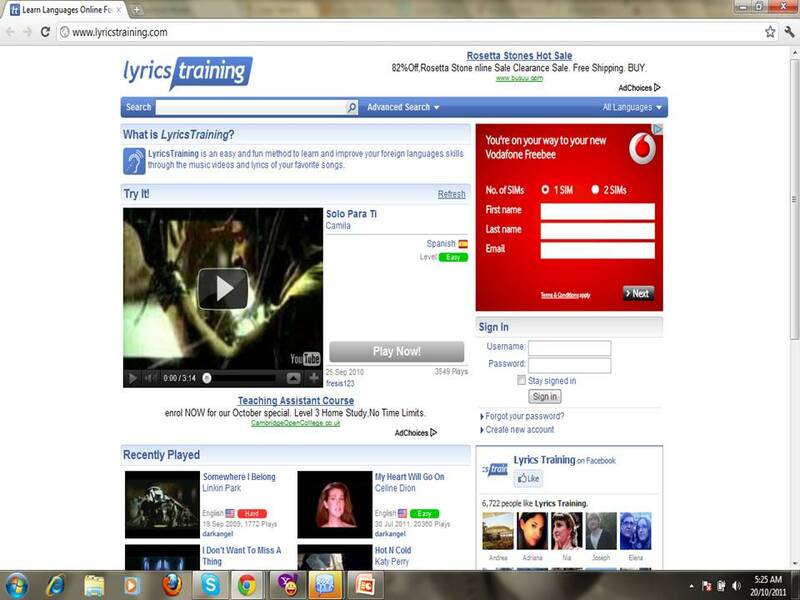 Lyrics Training is a tool which could be used by students to learn and improve their second/foreign language skills (example: English) by listening the song and complete the lyrics as they are sung. The videos in this tool are being categorized based on three level of mastery namely beginner, intermediate and expert.The songs could be found in different language which includes English, German, Spanish and French. # Choose the play level. There are three level available; beginner (Fill in the blanks 10%), Intermediate (fill in the blanks 25%) and expert (full lyrics). # In order to continue playing the song, the students need to complete each line (the blank line). The song is paused once you start to write. # To listen again to the last line, press backspace key. If you get stuck, you can click the 'give up!' button and see the word. # If the listener could not understand a word, they may press the tab key to jump to the next. # Once finished filling all the blanks, students can see their score. Pronunciation activity - In this activity, students can use the karaoke mode and try to sing the song with correct pronunciation. Spelling activity -This could be done as a competition. Students could be divided into few groups with the same level of language proficiency. Each members in the group will get the same song based on their level. Then, they practice filling the blanks of the chosen song and compare the score with their friends from the same group. Teacher could recommended this website for the students so that they can practise for themselves outside the classroom. They can practise their listening skills in a fun way. I am sure they like songs! Fun approach to help students learn their second language - no more rote memorization. The students can learn based on their language competency. They can listen to the YouTube-hosted music video for either beginner, intermediate or experts level. There are various songs available which could be chosen by the students. It is free to use and does not require registration. Students still can see their scores although they do not register. Teachers do not grade their quality of singing. So, everyone can have fun and do not have to worry whether their voice are nice or not. Training multiple skills which are writing, listening, spelling and pronunciation. Would favour the students who prefer visual,music and audio style of learning. The score that the students get could be a motivation for them. They might try to beat the previous score which could be a motivation for them to try harder. Students can submit their own songs and put the lyrics to them themselves. There are a range of songs which not only available in English but also in other languages (German, Spanish and French). Therefore, learning other languages is also possible. The Facebook link could be a distraction for them as they might log in into their Facebook account. Some songs might not be suitable for the students since it may use inappropriate language. Some students might cheat as they know the lyrics as they already familiar with the songs. Not suitable for those who are more into kinaesthetic and reading style of learning. They would not be interested in listening to music and watching videos. Some videos could possibly not suitable for the learners to watch. Some of the words in the song is quite difficult to catch. As the consequence, it might demotivate the students to carry on the activity. Facilities - some school might not have enough computers for all students and do not have access to the internet. Thus, this activity could not be done properly.